TORONTO, ON – March 24, 2016 – Technology and data company Engagement Labs, released rankings on the top U.S. airlines on social media and through word of mouth (WOM) conversations. The data consists of Engagement Labs’ proprietary eValue social media measurement tool and TalkTrack®, the leading measurement source of word of mouth conversations from the Keller Fay Group, an Engagement Labs company. 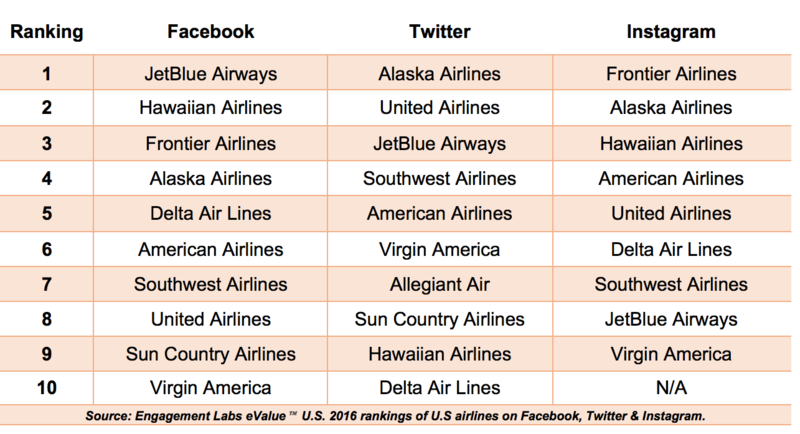 On Facebook, JetBlue Airways ranked first with the highest overall eValue, as well as the highest Responsiveness and Impact score. Hawaiian Airlines, which ranked second, had the highest Engagement score of the group and had the most likes per 1,000 fans, indicating that the content they are posting is resonating extremely well with its followers. When looking at Twitter, Alaska Airlines ranked first for overall eValue score, but more importantly Engagement Labs found that the airline industry is actively using the channel as a customer service platform by providing its passengers answers to their inquiries with helpful information. For example, Southwest Airlines ranked first for Responsiveness with the highest response rate, while JetBlue Airways ranked second for the subcategory with the fastest response speed average. On Instagram, Frontier Airlines placed first with the highest eValue score of the group and also scored the highest Engagement and most likes per 1,000 fans. Enlisting in user-generated content, the brand posted images of the airline’s planes in flight or landing in scenic locations, tagging the photographer and leveraging hashtags such as #avgeek, #viewfromabove and #instaaviation. “Building relationships with your customers and prospects only works to improve a brand’s performance and reputation. With the fluid nature of what is seen online and real world conversations, it’s more essential than ever for brands to maintain their positive relationships with fans through excellent content, creative, and response strategies,” continued Segal. According to TalkTrack data, Delta Air Lines and Southwest Airlines led with regard to the volume of offline WOM conversation, earning 20 percent and 19 percent, respectively, of the TalkShare (the percentage of conversation an individual brand has relative to WOM for all brands in the category) within the airline industry. Virgin America and JetBlue Airways earned the highest offline WOM sentiment amongst all airlines measured, with Southwest Airlines and Delta Air Lines ranking fourth and fifth. “A multitude of factors, including a positive experience, can ultimately contribute to offline conversations as indicated by the offline success of brands like JetBlue Airways, Virgin America and Alaska Airlines. Online conversation drives offline conversation and vice versa. Thus, by understanding and amplifying both online and offline conversations, not only does one grow conversations and sentiment around their brand, but ultimately a brand can positively impact their sales and bookings too,” noted Segal.